We write to add our voice to the 91% of Canadians who urge the government of Canada to introduce a universal, accessible, comprehensive and portable single-payer public prescription drug system by expanding the Canada Health Act to include prescription drugs dispensed outside hospital. We are among the more than 70 national and provincial organizations in Canada who urge the government to act now on universal pharmacare, to make it part of the Canadian Medicare system. 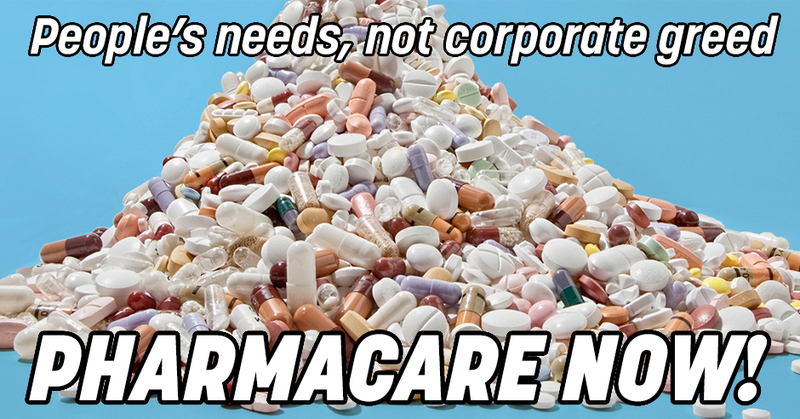 Health care, including prescription drugs, is a human right. Yet 8.4 million Canadians, most of them young or precarious workers, have to pay for their prescriptions. As a result many can’t afford to buy their prescription medications, or to take them as prescribed. Similarly, low income seniors who may have some drug coverage but whose incomes are too low to support the co-pay or deductibles they are required to pay, also can’t afford to buy their prescription medications, or to take them as prescribed. This leads inevitably to increased illness, more visits to doctors and hospitals, and more premature deaths. A national pharmacare plan that is part of Medicare and covered by the Canada Health Act is therefore urgent. We urge the government to act on the widespread support for pharmacare that already exists across Canada. Delays will result in more deaths, more illness, and increasing pressure on hospitals. What is needed now is action to add pharmacare to Canada’s Medicare system. The cost of pharmacare is the biggest issue remaining. Health Canada is already familiar with the $4 billion in annual savings that can be accrued with a single-payer system that enables bulk purchases by the government which will reduce the unit cost of drugs as well as the bulk costs. In fact, the $4 billion in annual savings is the most conservative estimate; other estimates range up to $11 billion annually. This figure takes into account the savings in the administrative costs of a single payer system, as opposed to the astronomical administrative costs of the current system involving more than 100 public plans and 100,000 private drug plans in Canada. We note that Canada already pays 20% more for prescription drugs than every other OECD country, other than the US. The government, and the public are being hosed by the big pharmaceutical industry whose main interest is not health, but profits. It’s time the Canadian government addressed this situation, by negotiating bulk purchases on behalf of the people of Canada, and by establishing a comprehensive drug formulary. The pharmaceutical industry is also the main problem in terms of patents, its determination to extend the longevity of patents from 5 years up to 10 years (or more), its opposition to generic drugs and manufacturers, and its ability to price and dump new drugs onto the market, that are not better than existing and cheaper drugs, in search of even larger profits. Changes to the patent act being considered by the government now would save $13.2 billion over 10 years, but would save much more if they repealed the patent extensions. NAFTA negotiations could make the cost of drugs even higher, if the US is successful in its efforts to increase and expand intellectual property rights to include drug testing on patented drugs. This would make it very difficult and expensive for generic drug manufacturers if they had to follow suit. The Canadian government could go much further however, and effectively address these problems by nationalizing the pharmaceutical companies and building a publicly owned and controlled generic drug industry to meet the needs of Canadians. Pharmacare can and should be paid for through taxation in a progressive tax system based on ability to pay. This would cover the costs of pharmacare, and also generate the funds needed to adequately and equitably fund healthcare and hospitals across Canada. It would also pay for the expansion of Medicare to include not only pharmacare, but also vision care, dental care, long-term care and mental health care. These are all services that should be included in Medicare and covered under the Canada Health Act. It has been noted in the Health Canada Discussion Paper that corporations are not taxed on the benefit packages they pay which are negotiated through collective bargaining. These are written off as employer expenses. Under a single payer public pharmacare program however, these benefits would be paid for from the public purse, and corporations would be taxed on these funds, as they should be. These taxes would support pharmacare. The estimated loss of tax revenue to the federal government due to employer expenses was $2.6 billion in 2016. No doubt that Big Pharma will cry blue murder if the federal government takes the urgent and necessary decision to implement a universal, accessible, comprehensive and portable single-payer public prescription drug system in Canada, and to fund it using progressive taxation policies based on ability to pay. Yet this is what the government should do, and be prepared to go further and to nationalize the big pharmaceutical companies if they do not or will not comply. Finally, the government should withdraw from the NAFTA agreement, which threatens the health and well-being of Canadians, with respect to healthcare and drug costs, as well as food security and safety, our agricultural producers, fishers and forestry workers, our environment, jobs, living standards and income security. This agreement also threatens Canada’s democracy and sovereignty. The Communist Party of Canada has campaigned for universal socialized medicine – Medicare – in Canada, since its birth in 1921. Canada’s best known Communist, Dr. Norman Bethune was the architect of the first system of socialized medicine in the early 1930’s, which was adopted and fought for by the labour and democratic movements in the post-war period, implemented in Saskatchewan by the CCF in 1962, and then across Canada in 1968. Medicare is just 50 years old in Canada, and still fighting to fulfill its original mandate to include universal pharmacare, as countries throughout the industrialized world have long since done. It’s time to expand Medicare, starting with pharmacare, and continuing with vision and dental care, long-term care, and mental health care. No to corporate greed. Yes to people’s needs!